CRESST developed a 3-D, computer-based simulation depicting the interior of a Navy ship, in which the player must assume command of a damage control repair locker. 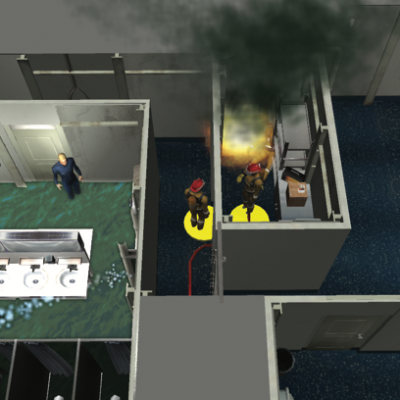 In this role, the player is tasked with identifying, responding to, and managing the containment of a variety of fire and flood casualties that break out in various areas of the ship. Using Bayesian inferencing, the game’s automated assessment engine analyzes all meaningful player actions and decisions, and provides estimates of the player’s proficiency in several key areas, including personnel safety, resource management, compartment integrity, communications, situational awareness, and decision making.